At 5:30 a.m. on Friday, July 17th, several SandRidge employees met on the east side of the corporate tower in Oklahoma City, climbed into a black Suburban and headed north. For an oil and natural gas producer whose operations are focused in northern Oklahoma and southern Kansas, this is not an uncommon occurrence. What was different about this trip, however, was that instead of heading to one of the company’s field offices or to a drilling site, this group was on their way to the town of Wakita, Oklahoma, to help the town’s residents build a playground. 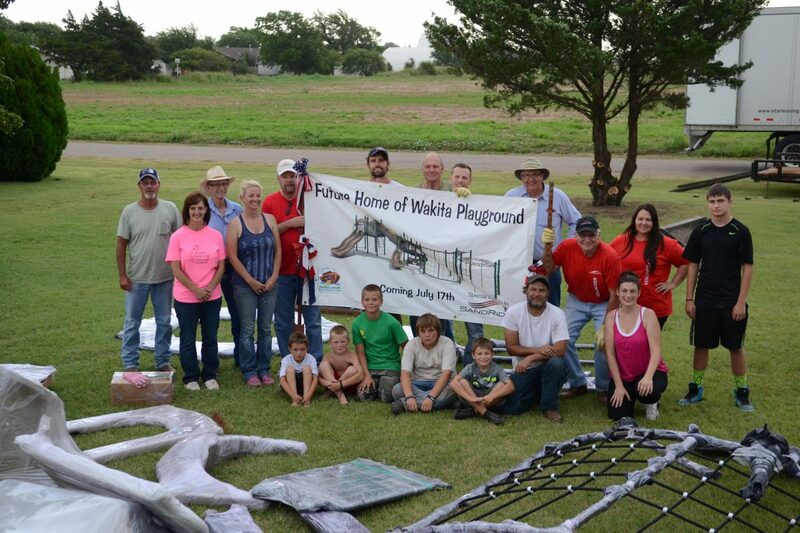 The day of the playground build was the culmination of several months of planning and coordination that began back in January, when Judy Johnson, a Wakita resident sent a letter to the SandRidge Community Outreach team, requesting support for her efforts in raising funds for playground equipment. At that same time, SandRidge was actively seeking projects that would provide opportunities for the company to develop stronger relationships with local communities in the areas where we operate. It seemed like a perfect match. Over the next several months, amid numerous phone calls and email exchanges, the plan to build the Wakita playground fell into place. A key partner in helping make this project happen was Edmond-based playground vendor, Noah’s Park and Playgrounds. Sales Rep Sharla Wilkerson worked tirelessly to help reduce costs, while ensuring the final product met expectations and safety requirements. One of the factors that helped lower the cost was the decision to do a supervised “community build,” as opposed to a full vendor installation. With the community build option, a supervisor from Noah’s Play leads community volunteers as they install the playground themselves. Those SandRidge employees who left OKC early Friday morning joined several Wakita townspeople in laying the foundational groundwork and getting the playground installation process moving forward. The townspeople finished the project Saturday morning and then held a dedication and blessing ceremony on Sunday.